Asus kembali menggebrak kelasnya. Tidak tanggung-tanggung Smartphone ini bisa disebut "Killer" untuk di kelasnya. Asus ZenFone 2 menghadirkan fitur dan desain ergonomis, mewah dengan lekukan anggun yang melengkung, dengan ketebalan ultra-slim, dan layar Full HD 5,5 inci dengan display IPS. The ASUS ZenFone 2 features all-new ergonomic luxe design with graceful curved case, ultra-slim edge, and 5.5-inch Full HD IPS display with 72% screen-to-body ratio. 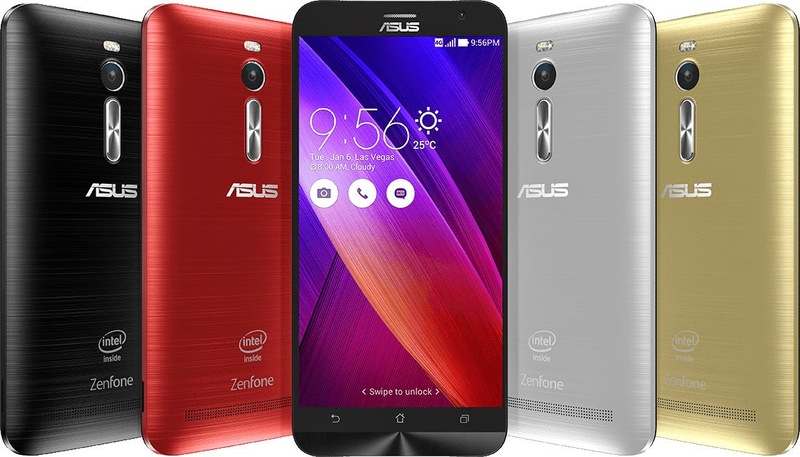 ASUS ZenFone 2 has a stunning, all-new design that employs iconic Zen design elements, offering a luxe brushed-metal finish and distinctive, elegant concentric circle detailing. Including a graceful curved case that tapers to an incredibly thin 3.9 mm at the edges lends ZenFone 2 a bold yet elegant look with intuitive volume control with Rear Key. Featuring a 5.5-inch Full HD IPS display with a 403ppi pixel density, the display has a slight 3.3 mm bezel, giving ZenFone 2 a remarkable 72% screen-to-body ratio for a maximized viewing experience. ZenFone 2 is powered by an up to 2.3 GHz 64-bit Intel Atom processor Z3580 and has 4 GB RAM to deliver up to seven times (7X)* faster gaming performance than its predecessor, so you'll enjoy slick web surfing, smooth video playback, great gaming experiences and multi-tasking that doesn't leave you waiting. ZenFone 2 comes with a 13 MP PixelMaster camera and an f/2.0 aperture lens to capture stunning, high-resolution photos with zero shutter lag. This industry-leading low-light mode employs pixel-merging technology to capture up to 400% brighter photos at night, or in low-light scenes, without the need for a flash. When a flash is preferred, ZenFone 2 is equipped with a Real Tone Flash to ensure warm skin tones and accurate color. Freedom, connection, and expression form the foundation for ASUS's ZenUI mobile user interface. In world first for smartphones, the ZenFone 2 can be customized to meet everyone's personal style and usage preferences including ZenUI's launcher, themes, fonts, icons, and more. ZenUI has a variety of new features, including ZenMotion, SnapView, Trend Micro Security and ZenUI Instant Updates that enhance usability; ensure security and privacy; and deliver a seamless user experience. ZenFone 2 is keeps going where other smartphones give up, and with our unique fast charging technology, you'll take your battery level to 60% in just 39 minutes! Untuk harga resmi, tunggu aja pengumuman dari situs resmi Asus. Dari kabar burung dibuka dengan harga US$ 199.